With all the talk within the news and lighting industry seeming to revolve around LEDs, (yes, we’re guilty as well) those not yet interested in trying solid state high bay lighting may be feeling a bit left out. However, while it may seem that all the new lighting developments involve LEDs, the truth is that HID and fluorescent high bay designs have been quietly undergoing improvements as well. Compared to standard high bay designs of the last 10 years, newer fluorescent and HID systems are offering increased efficiency and longevity as well as improved light quality. While LEDs are still making inroads into high bay applications, fluorescent and HID systems already have a proven track record of effectiveness, providing an extra degree of security for those as yet unprepared to make the jump to solid state lighting. Follow along as we look at some of the improvements traditional high bay systems have undergone and how this affects their overall performance. Metal halide has been the lighting of choice for high bay applications for many years. Powerful, good color temperature and CRI, and long lasting , metal halide systems are well suited to high bay applications where lighting is usually mounted 20 feet or higher over the work area. However, metal halide systems have typically had a few significant drawbacks which increased their operating cost and reduced their efficiency. The biggest issues with older traditional metal halide systems has been their slow warm up times, slow hot re-strike times, and tendency to experience significant color shifting and lumen loss as they age. Newer metal halide systems incorporate “Pulse Start” designs that have a slightly different bulb configuration and ballast type. Whereas a standard metal halide has three probes within the bulb which are used to ignite the lamp and maintain operation, newer pulse start designs have lamps with only two probes and an igniter module built into the ballast. The benefits of a pulse start MH over standard designs are substantial. Pulse start metal halide lamps can have an up to 50% longer operating life, which helps to reduce maintenance and replacement costs. 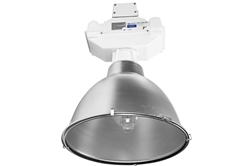 Since high bay lighting tends to be mounted at 20 feet or higher, it is usually the case that facilities hand off maintenance to third party specialists. This in turn can mean added downtime, facility operating disruptions, and added operating costs. This can become expensive for large facilities, and by increasing the time between servicing and replacement intervals, there are fewer disruptions to operations and fewer relampings, which, keeps productivity high, and lowers overall operating costs. Pulse start metal halides are more efficient than their standard HID cousins, up to 24% more efficient. Higher efficiency means more lumens produced per watt, or put another way, producing the same amount of light as a standard metal halide while using less energy. Obviously, this means you pay lower utilities costs for using less energy, which translates into lower operating costs. Pulse start MHs also improve efficiency through quicker startup and restrike times. Although a metal halide typically takes several minutes to reach full brightness, and requires a cool down period between on and off cycles, during the time they are warming up they are still consuming electrical power. Since the warm up and cool down period is shortened with pulse start systems, the lamps produce light sooner, reducing the wasted energy the warm up period represents. Pulse start HIDs also tend to have better color rendering, better lumen maintenance, and more stable color temperature maintenance over the life of the lamp. This means light levels and light quality remains higher for a longer period of time, which translates into better workplace safety and productivity. It also means that lamps can go longer between relampings, also saving on operating costs. For the operator seeking a powerful and effective high bay lighting solution, pulse start metal halide systems offer significant improvements over older designs. Operators can improve the overall quality of illumination provided, while also realizing a faster return on investment as well as better overall annual savings through higher operating efficiency. High bay HID lighting isn’t the only alternative to LEDs that has seen improvement. With the phase out of T12 fluorescent tubes and magnetic ballasts and certain T8 lamps, manufactures have developed high efficiency T5 and T5HO fluorescent designs capable of continuing the fluorescents’ long history of effectively meeting high bay lighting requirements. The most significant change with fluorescent lighting has been the switch from old style magnetic ballasts to electronic ballasts. Electronic ballasts provide faster startup times, no annoying fluorescent “hum”, no perceptible lamp flickering, and improved efficiency as compared to the old magnetic ballasts. They also last longer, and are not prone to leaking toxic materials when they fail. The T12 and some standard T8 bulbs were not deemed cost effective to upgrade by manufacturers and have been replaced by the high efficiency T8 and T5 lamps. Combined with the newer electronic ballasts, these T5HO and T8 systems offer up to 80% longer life over old T12s, 35 to 50% energy savings, better color rendering, and better lumen maintenance. T8 lamps produce modest to good light output, and as a result provide limited suitability for high bay applications. T5 and T5HO lamps on the other hand produce intense light output and have become the lamp of choice for most professional lighting system designers when using fluorescents. In many cases, fluorescent systems are being used to replace older metal halide systems due to their cheaper initial costs and longer lamp life, while also improving lighting effectiveness over the old systems. Although LEDs will continue to garner the lions share of attention in the coming years, it is worthwhile to remember that some of the more familiar lighting systems will continue to remain quite practical and effective. While it is quite likely that LEDs will eventually surpass even the venerable metal halide in overall efficiency and output, the time it will take for this to happen will likely be considerable. For operators wishing to continue with standard lighting designs, the options remain open, and their choices wide ranging.